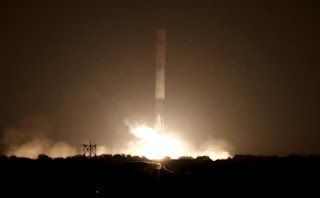 SpaceX launched several Orbcomm Satellites in their return to flight today. And SpaceX added a little something special. 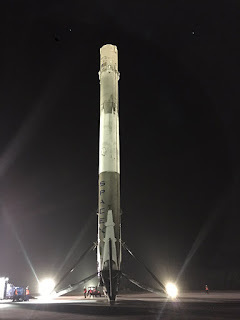 A rocket today landed on its tail as God and Robert Heinlein intended. Congrats to everybody at SpaceX. One valuable thing about this is that by being able to return the first stage to land, the engineers will be able to examine the rocket without it having been dunked in seawater. Seawater is highly corrosive so this will be a big boost for SpaceX and others in improving the quality and performance of rockets. +Douglas Cole wrote a nice post on a Introductory GURPS over on Gaming Ballistic which is a part of larger debate on the SJ Games forum on how to grow the fanbase of GURPS. Douglas has links to the relevant threads in his post. Since the early 2000s it was apparent that Munchkin was rapidly become way more successful than GURPS. With the number of employees that SJ Games could reasonably have it quickly became apparent that GURPS would get the short end when it came to development time. Eventually new products started being released as a pipeline for PDFs was established. Then the success of the OGRE kickstarter happened and that was that for a while. Now the PDF product line has been re-established and release are now coming out on a regular basis. All of this understandable and GURPS could have weathered it. However GURPS is now no longer the market leader when it come universal generic toolkit RPGs. Games like Savage Worlds and Fate have successfully taken over much of GURP's niche in the larger industry. GURPS still up there as shown by the few market surveys but Fate and Savage Worlds have performed just as well or better. Remember at one time GURPS was counted as the fourth or fifth most popular RPG in the industry. Now some argue that the reason that GURPS suffers from being too complex and baroque. My opinion what propels Savage Worlds and Fate is not simplicity but a variety of approaches. Yes a lot of Fate and Savage World products have a minimalist approach but there are lot of products that have rules subsystems that are very detailed like Starblazer Adventures for Fate. And because GURPS has been resource starved it doesn't enjoy that variety. There been attempts like the excellent Dungeon Fantasy line, Monster Hunters, Starships, etc. There are some very interesting alternatives buried in the issues of Pyramid. But in my view these efforts are not enough. To much of the PDF releases take the easy route and cater to the interest of the fanbase or the authors. Yes they are still uniformly of high quality but that that route leads to GURPS become a specialty product like Harn, Tekemul, or Glorantha. The foundation of my opinion is the fact that when my group ( +Tim Shorts +Dwayne Gillingham ) started group, we used the 2nd edition boxed set. In in the course of time we gave our original copies to other gamers in our area and got new copies. This was very successfully in roping in other GURPS players. But starting with 3rd edition this approach did not work. Now why is this? In my view the 3rd edition were a definite improvement while keeping the game largely the same. The same with the 4th edition rules being an improvement over the 3rd edition rules. What 2nd edition had going for it was presentation. Then as it is now the vast majority of roleplayers play D&D styles fantasy campaigns. Maybe not with the D&D rules but there are orcs, dungeons, dragons, and the lost. True alternatives are few and far between. With GURPS 2nd edition it was very clear how to run a D&D style fantasy campaign from the core rulebook. Yes you could run science fiction campaigns but the various list were obviously skewed toward the fantasy genres. The other thing was the fact that while 2nd edition had a fantasy skew wasn't D&D with a different set of rules. It was deadlier, more realistic, and above all you could easily see how to make the exact type of fantasy character you want to play. Partly because while GURPS 2nd had all the lists that 3rd and 4th edition had there were far fewer advantages, disadvantages, and skills you had to root through to understand how to create characters and run the game. Buried under the all the lists of GURPS 4th edition is still the same game that 2nd edition was. So it seems to me if you want have GURPS be more approachable then make a new presentation of GURPS core with similar details to that of 2nd edition. Now GURPS 2nd edition had some flaw, you had to buy a separate book for magic. Granted it was only 64 pages and not that expensive compared to buying the three AD&D 2nd edition hardcovers, but it still didn't make for a complete fantasy RPG. Why? Because GURPS pretty much always had a problem with monster manual. Something that dozens of other game system could manage GURPS never could quite manage. Yes at the tail end of 3rd edition it a really great collection of monsters but scattered across a dozen books. The original bestairy and Fantasy Beastiary were pretty poor in my opinion especially for fantasy. Today the DF line has some excellent monsters but again they are scattered among several products. My view is that that what GURPS should is make a GURPS Complete Fantasy books with all the elements that other Fantasy RPG including a decent listing of monsters, magic, and treasure. But it should try to ape the OSR and come out with a GURPS D&D clone like Dungeon Fantasy is. No what is should do is embrace the fantasy that was in 2nd edition. A world of 100 to 150 pt characters struggling to survive on adventures to win fame and glory. Where are monsters but their human foes are the worst enemies the adventurers face. That way GURPS Complete Fantasy will have a distinct niche to call it own. Then the DF line will then serve as support for people who want to go into a maze with monster inhabiting room filled with treasure. GURPS should not stop there but come out with GURPS Complete Space, and GURPS Complete Horror. Now I started advocating this several years ago. Since then Sean Punch and the stable of GURPS authors still kept on producing good material. Among those material was a article in Pyramid about pointless GURPS. This article builds on the ideas of the GURPS Starship and turns into options for character creations. GURPS Starships works by given spacecraft 20 slots and presenting list of options to fill those slots. Each of those options are built with the unpublished GURPS 4th edition Vehicles as well as the basic hull. But GURPS gamers doesn't see those points or the details. Each option is listed with how many slots it takes up so all you have to so it keep adding stuff until you fill up 20 slots. A far simpler task than what GURPS Vehicle has the gamer do with volume, and mass. Sean Punch's article in Pyramid does the same with characters. It offer several lists for Attirbutes, Backgrounds, Occupation, etc. Pick from a handful of lists without any worry about the calculating the exact amount of points. The result is a complete GURPS character. Best of all if you have a player who wants to go the traditional point based approach you can let him do that and it work just fine. So I would based the character creation of the GURPS Complete line around this pointless system. Then offer a designer note PDF detailing the point breakdown of the options for gamers who like the traditional points based approach. Like Ascending AC for classic D&D, I view pointless + notes as a win-win for the entire fanbase. The same thing that been done in the past but presented in a more approachable form. Last I don't see the resource shortage for GURPS easing up anytime soon for SJ Games. They are going to have to decide whether they want to have GURPS be a niche game for at least the next decade or open GURPS up and let the fan base direct the future of GURPS via a open content license. Personally what I would recommend given what we know Steve Jackson feelings is to give GURPS a license similar to the OGL but with the restriction that it can only be published at one site with SJ Game taking a royalty out of every sale. Whether that site is Warehouse23 or a special arrangement with RPGNow/DriveThruRPG is up to SJ Games. But restricting it to one site would allow them keep control of the third party market even with a otherwise open license to produce content. So what is the situation for my group now. Well we have turned to Green Ronin's Fantasy Age and currently exploring the possibilities of that system. We like the fact it is 3d6 roll high. The stunt die system over a nice way of handling critical. It is somewhat skill based although it does have classes. It allows for deadly combat but still give a place for D&D style monster. I will do a fuller review later on. I really do hope SJ Games figures out a better way of making GURPS presentable.